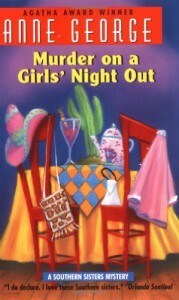 Murder on a Girls' Night Out - Anne George - review - What is Kimberly reading now? I liked this, but I'm not in love with it. Mouse and Sister are funny and cute and make a good pair. The mystery was easy going. I didn't have to spend a lot of time trying to figure out the mystery because the characters were more the star here.